Sean Michael Spicer (born September 23, 1971) is an American political aide who served as the twenty-eighth White House Press Secretary and as White House Communications Director under President Donald Trump in 2017. Spicer was communications director of the Republican National Committee from 2011 to 2017, and its chief strategist from 2015 to 2017. During his tenure as White House press secretary, Spicer made a number of public statements that were controversial and false, and he developed a contentious relationship with the White House press corps. The first such instance occurred on January 21, 2017, the day following Trump's inauguration. Spicer repeated the claim that crowds at Trump's inauguration ceremony were the largest ever at such an event and that the press had deliberately under-estimated the number of spectators. After this statement was widely criticized, Trump aide Kellyanne Conway said that Spicer had presented what she called "alternative facts" regarding the inauguration's attendance numbers. Spicer resigned as White House Press Secretary on July 21, 2017, although he remained at the White House in an unspecified capacity until August 31. Spicer is the son of Kathryn (née Grossman) and Michael William Spicer (1944–2016). The Spicers were living in Port Washington when Sean was born at North Shore Hospital in Manhasset, New York. Spicer grew up in the East Bay area of Rhode Island. His father was an insurance agent and his mother is the department manager in the East Asian studies department at Brown University. Spicer is of partial Irish descent, and was raised Catholic. From 1985 to 1989, Spicer attended Portsmouth Abbey School, a Roman Catholic boarding school in Rhode Island. While in high school, he volunteered for local political campaigns in Rhode Island and continued those activities while at college. He attended Connecticut College from 1989 to 1993 and graduated with a Bachelor of Arts degree in government. In college he was a student senator. 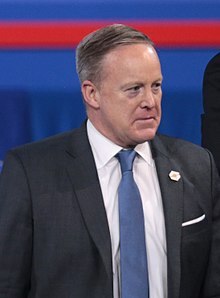 In April 1993, an article in the student paper, The College Voice, referred to Spicer as "Sean Sphincter"; Spicer submitted an angry complaint to the paper and followed up by pushing for college judicial action against the paper, for which he received further ribbing from the campus satirical publication Blats. The incident was later cited as a precursor of his contentious relationship with the media in later years. In 2012, he earned a master's degree in national security and strategic studies from the Naval War College in Newport, Rhode Island. After graduating from college in 1993, Spicer worked on a number of political campaigns. In the late 1990s, he worked for representatives Mike Pappas (R-NJ), Frank LoBiondo (R-NJ), Mark Foley (R-FL), and Clay Shaw (R-FL). In 1999, Spicer joined the United States Navy Reserve as a public affairs officer; he currently holds the rank of commander. As of December 2016, he was assigned to the Joint Chiefs of Staff's naval reserve contingent in Washington, D.C.
From 2000 to 2001, Spicer was the communications director on the House Government Reform Committee, and from 2001 to 2002, he was director of incumbent retention at the National Republican Congressional Committee (NRCC). From 2003 to 2005, Spicer was the communications director and spokesman for the House Budget Committee. He subsequently was the communications director for the Republican Conference of the U.S. House of Representatives, and then, from 2006 to 2009, was the assistant for media and public affairs at the Office of the United States Trade Representative in President George W. Bush's administration. He wore an Easter bunny suit during the White House Easter Egg Rolls. From 2009 to 2011, Spicer was a partner at Endeavor Global Strategies, a public relations firm he co-founded to represent foreign governments and corporations with business before the U.S. government. His clients included the government of Colombia, which was then seeking a free trade agreement with the U.S. amid public criticism of its human rights record. Spicer worked full-time at the firm until February 2011. In February 2011, Spicer became the communications director of the Republican National Committee. At the RNC, he enlarged the organization's social media operations, built an in-house TV production team, and created a rapid response program to reply to attacks. In February 2015, he was given an additional role, as chief strategist for the party. While at the RNC, Spicer was critical of then Republican presidential candidate Donald Trump. In June 2015, after Trump said illegal immigrants from Mexico were involved in crimes in the U.S., Spicer said "painting Mexican Americans with that kind of a brush, I think that's probably something that is not helpful to the cause." In July 2015, he released a public criticism of Trump's comments on U.S. Senator John McCain, saying "there is no place in our party or our country for comments that disparage those who have served honorably." On December 22, 2016, Spicer was named the White House press secretary for Donald Trump. On December 24, he was also named the communications director for the Trump administration after the sudden and unexpected resignation of Jason Miller. An April 2017 Politico/Morning Consult poll showed that Spicer had a nationwide name recognition of 60%, much higher than most other White House staffers and previous press secretaries. On January 21, 2017, which was the day after the inauguration and two days before his first official press conference, Spicer made a statement to the press that was negatively critical of the media; he said that they had underestimated the size of the crowds for President Trump's inaugural ceremony. He claimed that the ceremony had drawn the "largest audience to ever to witness an inauguration, period – both in person and around the globe". But as many sources immediately pointed out, that claim was false. Spicer stated that the press had altered images of the event to minimize the size of the crowds. He said floor coverings over the grass were to blame for a visual effect that made the audience look smaller, and stated they had never been used before despite the fact that they had been used in 2013 for the preceding second inauguration of Barack Obama. He also used incorrect figures to claim that Metro ridership was higher during Trump's inauguration than during Obama's inauguration, when in fact it was lower than during either of Obama's inaugurations. Spicer took no questions after his statement. Later, Spicer defended his previous statements by saying "sometimes we can disagree with the facts". It was subsequently reported that Spicer had made the statement on direct orders from Trump, who was furious at what he considered unfair press coverage of his inauguration. In response to the briefing, conservative political analyst Bill Kristol wrote: "It is embarrassing, as an American, to watch this briefing by Sean Spicer from the podium at the White House." Vanity Fair described Spicer's statement as "peppered with lies", and The Atlantic described Spicer's briefing as "bizarre". The article referred to the "Trump administration's needless lies" and noted that Spicer's statements appeared to involve a "deliberate attempt to mislead". Glenn Kessler of The Washington Post gave Spicer's claims four Pinocchios, writing that he was so appalled by the press secretary's performance that he wished he could have given him five Pinocchios instead of the maximum number of four. Trump's team defended Spicer's statements. White House chief of staff Reince Priebus stated that the purpose of Spicer's conference was to call out what he called "dishonesty in the media" and their "obsession with delegitimizing the president". Trump's campaign strategist and counselor, Kellyanne Conway, told NBC's Chuck Todd that Trump's inauguration crowd numbers could not be proved nor quantified and that the press secretary was simply giving "alternative facts". Todd responded by saying, "Alternative facts are not facts. They are falsehoods." Two days later on January 23, 2017, Spicer held his first official White House press conference and took questions from reporters. When Spicer was asked about attendance at the inauguration, he said that his definition of a viewing audience also included individuals who watched the event on television as well as on social media online. He claimed that online viewership must have been in the "tens of millions". Spicer's argument was based on the reported figure of 16.9 million people who began streaming the inauguration on CNN's website. This argument has been criticized because the 16.9 million streams included people who started the stream and then left. On February 7, 2017, CNN reported that "President Donald Trump is disappointed in Spicer's performance during the first two weeks of the administration." Trump was also upset at White House chief of staff Reince Priebus for recommending Spicer, the network reported. Trump "regrets it every day and blames Priebus", a White House source told CNN. His role as temporary communications director was filled by Michael Dubke on March 6, 2017. On April 11, 2017, Spicer issued a statement in reference to the Khan Shaykhun chemical attack. He said that Russia should not support the Syrian government and also commented that in World War II "You had someone as despicable as Hitler who didn't even sink to using chemical weapons." His remarks were widely criticized, especially given the fact that the timing of the remarks coincided with the Jewish holiday of Passover. Spicer later clarified that he was not trying to deny that Hitler used lethal gas during the Holocaust, instead that he was trying to compare how Assad dropped bombs on population centers to how Hitler used the gas. Amid calls for his resignation, Spicer apologized the next day. As White House press secretary, Spicer had a contentious relationship with the White House press corps. In February 2017, the White House selectively blocked several news outlets—including the BBC, CNN, The New York Times, Los Angeles Times and Politico—from an off-camera briefing (or "gaggle") with Spicer, a move that prompted strong objections from the outlets concerned, as well as by the White House Correspondents' Association. The Washington Post wrote that the barring of the outlets was "a rare and surprising move that came amid President Trump's escalating war against the media." Reporters from the Associated Press and Time magazine were admitted to the briefing, but chose not to attend in protest of the exclusion of other journalists. On July 11, 2017, Spicer, along with Donald Trump, and Dan Scavino (the White House director of social media), was sued by the Knight First Amendment Institute at Columbia University in U.S. federal court in Manhattan. The suit, Knight First Amendment Institute v. Trump, alleges that Trump and the White House officials violated the First Amendment by blocking some users from accessing Trump's Twitter content. On July 21, 2017, Spicer announced his intention to resign as White House Press Secretary. He made his decision known immediately after President Trump appointed financier Anthony Scaramucci as White House communications director. In the weeks leading up to the resignation announcement, Spicer had sought "a more strategic communications role" in the White House. Trump had reportedly been dissatisfied for some time with Spicer's performance as White House Press Secretary. According to The New York Times, Trump asked Spicer to stay on, but Spicer announced his resignation after telling the President he "vehemently disagreed" with the appointment of Scaramucci. In a tweet, Spicer said that it has been "an honor and a privilege" to serve Trump and that he would continue his service in the White House, through August 2017. His new position was not identified. Sarah Huckabee Sanders was announced as the new White House Press Secretary the same day. After several low-profile months, Spicer made a cameo appearance at the presentation of the Emmy Awards on September 17, spoofing his own image by predicting that the Emmys broadcast would garner "the largest audience to witness an Emmys, period". The following week he gave an interview to The New York Times and appeared on Good Morning America. Also, it was revealed that during his eight-month tenure at the White House he kept copious notes on what he did, saw, and heard, filling numerous notebooks. The revelation provoked speculation that the notebooks would be of interest to the investigation of special prosecutor Robert Mueller. Spicer announced in December 2017 on The Sean Hannity Show that he would release a book, The Briefing: Politics, the Press, and the President, in July 2018 about his tenure with the Trump administration. On November 13, 2004, Spicer married Rebecca Miller, at the time a television producer, at St. Alban's Episcopal Church in Washington, D.C. Spicer and his wife live in Alexandria, Virginia. They have two children. His wife is senior vice president, communications and public affairs, for the National Beer Wholesalers Association. He is Roman Catholic. Several commentators have compared Spicer to "Baghdad Bob", Information Minister under Iraqi President Saddam Hussein. Spicer's frequently combative press conferences were satirized four times on Saturday Night Live in 2017, with actress Melissa McCarthy playing the role of Spicer. Her portrayal was described by a staff writer at The Atlantic as "genius", mixing "energy and weaponized hostility". Spicer stated that he found the skits funny, but suggested that McCarthy "could dial back" a bit. ^ "Mysterious disappearance of Donald Trump's mouthpiece Sean Spicer". The New Zealand Herald. June 6, 2017. Retrieved June 30, 2017. ^ "Sean Spicer: Executive Profile and Biography". Bloomberg. Archived from the original on November 11, 2016. Retrieved January 3, 2017. ^ a b Kessler, Glenn (January 22, 2017). "Spicer earns Four Pinocchios for false claims on inauguration crowd size". The Washington Post. Archived from the original on January 22, 2017. Retrieved January 23, 2017. He managed to make a series of false and misleading claims in service of a relatively minor issue....Spicer earns Four Pinocchios, but seriously, we wish we could give five. ^ Aaron Blake (April 18, 2017). "The White House's misleading statements about Trump's 'armada' heading to North Korea". Washington Post. ^ a b Ted Johnson (July 21, 2017). "Sean Spicer Resigns as White House Press Secretary". Variety. Spicer had been with the administration from the start, but almost immediately had a contentious relationship with the media. ^ a b Kevin Liptak (January 21, 2017). "Reality Check: Sean Spicer hits the media over crowds". CNN. Spicer launched into a tirade against the media Saturday, slamming what he said was unfair reporting of the attendance of President Donald Trump's inauguration, along with other criticisms. Many of the facts he cited, however, are inaccurate. ^ Nguyen, Tina. "Sean Spicer's Agony Will Never End—to His Boss's Delight". Vanity Fair. ^ Grynbaum, Michael M. (March 31, 2017). "For April Ryan, Clashes With the White House Bring a New Kind of Prominence". The New York Times. Archived from the original on April 2, 2017. ^ Byers, Dylan (February 15, 2017). "Sean Spicer isn't finished". Politics. CNN. Archived from the original on May 12, 2017. Retrieved May 19, 2017. ^ a b Benwell, Max (January 23, 2017). "White House press conference: When is it, how can I watch it, and what will Sean Spicer say?". The Independent. Archived from the original on February 2, 2017. Retrieved January 23, 2017. ^ a b "Sean Spicer resigns as White House press secretary". CBS News. July 21, 2017. ^ a b Glenn Thrush (July 21, 2017). Sean Spicer Resigns as White House Press Secretary. The New York Times. ^ Santos, Amanda Proença (July 31, 2017). "Scaramucci Sets New Record for Shortest Term as Communications Director". NBC News. Retrieved August 20, 2018. ^ "Michael W. Spicer". NewportRI.com. December 3, 2016. Retrieved December 14, 2017. ^ Arsenault, Mark (February 8, 2017). "The 17 rules of Sean Spicer, Rhode Island native". The Boston Globe. Archived from the original on February 27, 2017. Retrieved February 26, 2017. ^ "Episode 110: Sean Spicer". University of Chicago Institute of Politics. Archived from the original on January 26, 2017. Retrieved January 25, 2017. ^ Lowry, Rich (December 1, 2016). "Trump on Twitter: I'll punish companies that ship jobs overseas". Politico. Archived from the original on December 23, 2016. Retrieved December 22, 2016. ^ McGee, Sandy (December 22, 2016). "President Elect's New Press Secretary's Local School Ties". Portsmouth Press. Retrieved January 31, 2017. ^ Kalunian, Kim (December 26, 2016). "RI native Sean Spicer on journey to White House". Providence, Rhode Island: WPRI-TV. Archived from the original on February 1, 2017. Retrieved January 23, 2017. ^ "Sean Spicer – Former Guest Speaker". Leadership Institute. Archived from the original on November 11, 2016. Retrieved November 11, 2016. ^ Charlie Savage; Eric Lipton; Gardiner Harris; Michael D. Shearjan (January 23, 2017). "Spicer's first war with the news media: Sad!". The New York Times. "Taxpayers Will Defend Trump in Suit Charging Constitutional Violations". ^ Daniel Bates (February 8, 2017). "From Sean Sphincter to Saturday Night Live: How Sean Spicer became a punchline". International Business Times. Archived from the original on February 11, 2017. ^ Dicker, Rachel (January 23, 2017). "10 Things You Didn't Know About Sean Spicer". US News and World Report. ^ Grynbaum, Michael M. (January 29, 2017). "Sean Spicer, Trump Press Secretary, Is 'Not Here to Be Someone's Buddy'". The New York Times. Archived from the original on February 11, 2017. Retrieved February 11, 2017. ^ Schmitt, Eric (May 2, 1997). "Bill Financing House Panels Passes as G.O.P. Rebels Gain". The New York Times. Archived from the original on January 29, 2017. Retrieved January 23, 2017. ^ Morgan, Dan (April 2, 1997). "On Hill, Campaign Duties Seldom Far Away". The Washington Post. Archived from the original on February 19, 2017. Retrieved January 23, 2017. ^ Vita, Matthew; Eilperin, Juliet (November 10, 2000). "House Race Recounts Also May Be Crucial". The Washington Post. Archived from the original on February 19, 2017. Retrieved January 23, 2017. ^ Edwards, Jane (December 23, 2016). "Trump Picks Navy Reserve Commander Sean Spicer as White House Press Secretary". ExecutiveGov.com. Archived from the original on December 26, 2016. Retrieved January 31, 2017. ^ "The next White House Press Secretary is a Navy officer". Military Times. Archived from the original on January 28, 2017. ^ a b "Republican National Committee (RNC) Organization 2015". DemocracyInAction. Archived from the original on October 13, 2016. Retrieved January 22, 2017. ^ a b Alexander, David (December 23, 2016). "Trump taps RNC's Spicer for White House spokesman". Reuters. Archived from the original on January 29, 2017. Retrieved January 22, 2017. ^ Davis, Julie Hirschfeld (April 12, 2017). "The Latest Test for the White House? Pulling Off Its Easter Egg Roll". The New York Times. p. A1. Archived from the original on May 3, 2017. Retrieved April 12, 2017. ^ Ariel Alexovich; Jacqueline Klingebiel. "Suite Talk March 12, 2009". Politico. Archived from the original on January 28, 2017. Retrieved January 24, 2017. ^ "K Street Files: Colombia Is ... Controversy". Archived from the original on January 29, 2017. Retrieved January 25, 2017. "K Street Files: Colombia is controversy," Roll Call, September 8, 2009; retrieved January 25, 2017. ^ a b Cillizza, Chris (February 24, 2011). "Sean Spicer chosen as RNC communications director". The Washington Post. Retrieved January 22, 2017. ^ Preston, Mark (February 1, 2015). "Top RNC communicator expands role". CNN. Archived from the original on January 29, 2017. Retrieved January 23, 2017. ^ "RNC: Trump's immigration rhetoric 'not helpful'" Archived February 2, 2017, at the Wayback Machine, MSNBC, June 18, 2015, retrieved January 25, 2017. ^ "RNC statement in response to Donald Trump's comments on U.S. Senator John McCain," Archived January 27, 2017, at the Wayback Machine GOP.com, retrieved January 25, 2017. ^ Byers, Dylan (December 22, 2016). "Trump Picks Sean Spicer as White House Press Secretary, Jason Miller as Communications Director". CNN. Archived from the original on December 22, 2016. Retrieved December 22, 2016. ^ "Transition adviser's tweets add intrigue to Trump aide Jason Miller's sudden resignation". The Washington Post. December 25, 2016. Archived from the original on January 1, 2017. Retrieved January 2, 2017. ^ Karni, Annie; Palmeri, Tara (April 17, 2017). "White House aides grapple with newfound celebrity". Politico. Archived from the original on May 4, 2017. Retrieved April 20, 2017. ^ a b Cillizza, Chris (January 21, 2017). "Sean Spicer held a press conference. He didn't take questions. Or tell the whole truth". The Washington Post. Archived from the original on January 22, 2017. Retrieved January 22, 2017. ^ "White House press secretary attacks media for accurately reporting inauguration crowds". CNN. January 21, 2017. Archived from the original on January 22, 2017. Retrieved January 21, 2017. ^ Bennett, Brian (January 22, 2017). "What the White House said about Trump's inauguration crowd and how it was wrong". The San Diego Union-Tribune. Retrieved January 23, 2017. ^ Helsel, Phil (January 21, 2017). "Trump Press Secretary Slams Media Over Inauguration Crowd Size Coverage". NBC News. Archived from the original on January 23, 2017. Retrieved January 23, 2017. ^ Siddiqui, Faiz (January 23, 2017). "Trump White House admits its Metro ridership figures for Inauguration Day were wrong". The Washington Post. Archived from the original on January 24, 2017. Retrieved January 24, 2017. ^ "Donald Trump's press secretary says 'we can sometimes disagree with the facts'". The Independent. UK. January 23, 2017. Archived from the original on February 2, 2017. Retrieved February 1, 2017. ^ "The first days inside Trump's White House: Fury, tumult and a reboot". The Washington Post. January 23, 2017. Archived from the original on January 24, 2017. Retrieved January 24, 2017. ^ Stelter, Brian (January 21, 2017). "White House press secretary attacks media for accurately reporting inauguration crowds". CNN. Archived from the original on January 22, 2017. Retrieved January 22, 2017. ^ Makarechi, Kia. "Trump Spokesman's Lecture on Media Accuracy Is Peppered With Lies". Vanity Fair. Archived from the original on January 22, 2017. ^ Graham, David A. "'Alternative Facts': The Needless Lies of the Trump Administration". The Atlantic. Archived from the original on January 22, 2017. ^ Feldman, Josh (January 22, 2017). "Chris Wallace Grills Priebus: 'How Does Arguing About Crowd Size' Help the American People?". Mediaite. Archived from the original on January 24, 2017. Retrieved January 23, 2017. ^ Jaffe, Alexandra (January 22, 2017). "Kellyanne Conway: Spicer 'gave alternative facts' on inauguration crowd". NBC News. Archived from the original on January 22, 2017. Retrieved January 22, 2017. ^ Stableford, Dylan (January 22, 2017). "Kellyanne Conway cites 'alternative facts' in tense interview with Chuck Todd over false crowd size claims". Yahoo! News. Archived from the original on May 19, 2017. Retrieved May 19, 2017. ^ "White House spokesman Sean Spicer's first official press conference". Archived from the original on January 23, 2017. ^ "Sean Spicer Takes Questions From Media During First White House Briefing". CBS News. January 23, 2017. Archived from the original on January 28, 2017. Retrieved January 24, 2017. ^ Johnson, Jenna (January 23, 2017). "Sean Spicer at press briefing: 'Our intention is never to lie to you'". The Washington Post. Archived from the original on January 23, 2017. Retrieved January 24, 2017. ^ Bump, Philip (January 23, 2017). "There's no evidence that Trump's inauguration was the most-watched in history. Period". The Washington Post. Archived from the original on January 24, 2017. Retrieved January 25, 2017. ^ Savransky, Rebecca (February 7, 2017). "CNN: Trump regrets hiring Spicer, blames Priebus". The Hill. Archived from the original on May 17, 2017. Retrieved May 19, 2017. ^ "President Donald J. Trump Announces White House Staff Appointments". whitehouse.gov. March 6, 2017. Archived from the original on March 7, 2017. ^ "Press Briefing by Press Secretary Sean Spicer, 4/11/2017, #36". whitehouse.gov. April 11, 2017. Archived from the original on May 6, 2017. MR. SPICER: I think a couple things. You look -- we didn't use chemical weapons in World War II. You had someone as despicable as Hitler who didn't even sink to using chemical weapons. So you have to, if you're Russia, ask yourself is this a country that you and a regime that you want to align yourself with? You have previously signed on to international agreements rightfully acknowledging that the use of chemical weapons should be out of bounds by every country. To not stand up to not only Assad, but your own word, should be troubling. ^ Nicholas Fandos; Mark Landler (April 11, 2017). "Sean Spicer Raises Outcry With Talk of Hitler, Assad and Poison Gas". The New York Times. p. A13. Archived from the original on May 2, 2017. Retrieved April 12, 2017. ^ a b Tani, Maxwell (April 12, 2017). "Sean Spicer apologizes for Hitler comparison: 'It really is painful to myself to know that I did something like that'". Business Insider. Archived from the original on May 4, 2017. Retrieved April 12, 2017. ^ Moraes, Lisa de. "Sean Spicer Gobsmacks Press, Saying Hitler 'Did Not Use Gas On His Own People' – Update". Deadline.com. Archived from the original on May 23, 2017. Retrieved April 11, 2017. ^ Grynbaum, Michael (April 12, 2017). "'I Screwed Up': Sean Spicer Apologizes for Holocaust Comments". The New York Times. Retrieved July 31, 2017. ^ Gold, Hadas (February 24, 2017). "White House selectively blocks media outlets from briefing with Spicer". Politico. Retrieved July 31, 2017. ^ a b Siddiqui, Sabrina (February 25, 2017). "Trump press ban: BBC, CNN and Guardian denied access to briefing". The Guardian. Retrieved July 31, 2017. ^ a b c Farhi, Paul (February 24, 2017). "CNN, New York Times, other media barred from White House briefing". The Washington Post. Retrieved July 31, 2017. ^ Savage, Charlie (July 11, 2017). "Twitter Users Blocked by Trump File Lawsuit". The New York Times. Retrieved July 12, 2017. ^ Acosta, Jim; Diamond, Jeremy (June 20, 2017). "Sean Spicer Might Be Leaving White House Podium". CNN. ^ Farber, Madeline (July 21, 2017). "Sarah Huckabee Sanders Is Officially Taking Sean Spicer's Old Job". Time. Retrieved July 21, 2017. ^ Thrush, Glenn (September 18, 2017). "Sean Spicer Says He Regrets Berating Reporters Over Inauguration Crowds". The New York Times. Retrieved September 24, 2017. ^ Hill, Libby (September 21, 2017). "Sean Spicer's Emmys cameo was Trump-approved: 'He thought I did a great job'". Los Angeles Times. Retrieved September 24, 2017. ^ Merica, Dan; Zeleny, Jeff (September 21, 2017). "Spicer's note-taking could give investigators a Trump roadmap". CNN. Retrieved September 24, 2017. ^ Andrews, Travis M. (December 11, 2017). "Sean Spicer announces book to 'set the record straight' about Trump's campaign, presidency". The Washington Post. Retrieved January 15, 2018. ^ Terris, Ben; Terris, Ben (August 16, 2016). "What happens when you tie your career to Donald Trump? Ask Sean Spicer in a few months". The Washington Post. Archived from the original on January 26, 2017. Retrieved January 31, 2017. ^ Roberts, Kayleigh (January 22, 2017). "Who Is Sean Spicer? 10 Things to Know About Trump's Pick for Press Secretary". Cosmopolitan. Archived from the original on January 29, 2017. ^ "Rebecca Spicer". National Beer Wholesalers Association. Archived from the original on February 2, 2017. Retrieved February 7, 2016. ^ J.A. (July 22, 2017). "Donald Trump's spokesman quits". The Economist. Retrieved July 24, 2017. ^ Palmer, Tara (August 29, 2017). "Spicer gets his audience with the pope". Politico. A devout Catholic, he told reporters ahead of President Donald Trump’s meeting with the pope during his Vatican visit that he was looking forward to meeting the pope and had brought rosary beads to be blessed. ^ Nguyen, Tina (February 9, 2017). "The Agony of Sean Spicer". Vanity Fair. Retrieved May 19, 2017. ^ Zorn, Eric (January 23, 2017). "'Baghdad Sean' Spicer doubles down on crowd lies". Chicago Tribune. Archived from the original on February 23, 2017. Retrieved May 19, 2017. ^ Byers, Dylan (March 21, 2017). "How Sean Spicer lost his credibility". CNNMoney. Archived from the original on March 23, 2017. Retrieved May 19, 2017. ^ Stableford, Dylan (February 5, 2017). "Melissa McCarthy steals the show as a raging Sean Spicer on 'SNL'". Yahoo! News. Archived from the original on February 5, 2017. Retrieved February 5, 2017. ^ Robinson, Joanna (February 12, 2017). "S.N.L. : Watch Melissa McCarthy's Sean Spicer Return to Hit Donald and Ivanka Trump Where It Hurts". Vanity Fair. Archived from the original on February 12, 2017. Retrieved February 12, 2017. ^ Harrington, Rebecca (April 16, 2017). "Melissa McCarthy returns to 'SNL' as Sean Spicer in an Easter Bunny costume". Business Insider. Archived from the original on May 17, 2017. Retrieved April 17, 2017. ^ Morona, Joey (July 21, 2017). "All the times Melissa McCarthy impersonated Sean Spicer, ranked". Cleveland. Retrieved July 21, 2017. ^ Gilbert, Sophie (February 5, 2017). "The Genius of Melissa McCarthy as Sean Spicer on Saturday Night Live". The Atlantic. Archived from the original on February 5, 2017. Retrieved February 5, 2017. ^ Amatulli, Jenna (February 6, 2017). "Sean Spicer Responds To Melissa McCarthy's 'Saturday Night Live' Sketch". The Huffington Post. Archived from the original on February 6, 2017. Retrieved February 6, 2017. This page was last edited on 27 March 2019, at 21:44 (UTC).